Moran, C. (2018). Learners Without Borders: Connected Learning in a Digital Third Space. 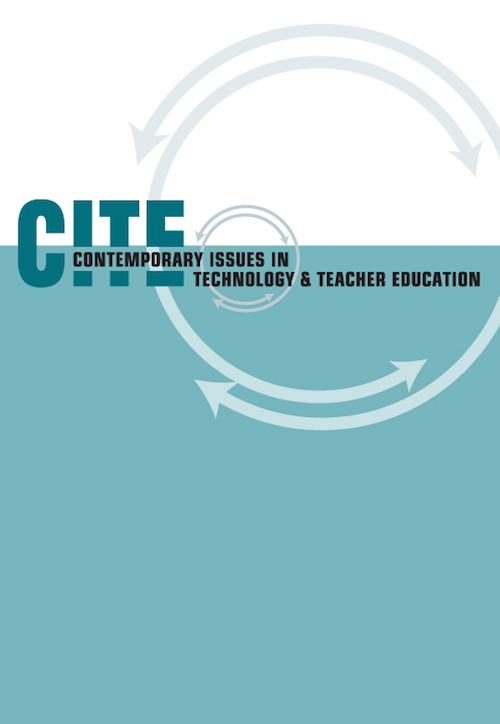 Contemporary Issues in Technology and Teacher Education, 18 (2), 233-254. Waynesville, NC USA: Society for Information Technology & Teacher Education. Retrieved April 21, 2019 from https://www.learntechlib.org/primary/p/180742/. Abas, M.C. (2016). Difficulties in field-based observation among pre-service teachers: Implications to practice teaching. International Journal of Evaluation and Research In Education, 5(2), 101-112. Al-Hassan, O., Al-Barakat, A., & Al-Hassan, Y. (2012). Pre-Service teachers' reflections during field experience. Journal of Education for Teaching: International Research and Pedagogy, 38(4), 419-434. Bali, M., Caines, A., DeWaard, H., & Hogue, R.J. (2016). Ethos and practice of a connected learning movement: Interpreting virtually connecting through alignment with theory and survey results. Online Learning, 20(4), 212-229. Banas, J.R., & York, C.S. (2014). Authentic learning exercises as a means to influence preservice teachers' technology integration self-efficacy and intentions to integrate technology. Australasian Journal of Educational Technology, 30(6), 728-746. Barab, S.A., Makinster, J.G., & Scheckler, R. (2003). Designing system dualities: Characterizing a web-supported professional development community. Information Society, 19(3), 237-256. Benson, S. (2010). “I don't know if that’d be English or not”: Thirdspace theory and literacy instruction. Journal of Adolescent& Adult Literacy, 53(7), 555-563. Bogdan, R., & Biklen, S. (1992). Qualitative research for education: An introduction to theory and methods. Boston, MA: Allyn & Bacon. Black, J., & Cap, O. (2014). Promising practices in higher education: Art education and human rights using information, communication technologies (ICT). Journal of Inquiry and Action in Education, 6(1), 33-50. Booth, S.E. (2012). Cultivating knowledge sharing and trust in online communities for educators. Journal of Educational Computing Research, 47(1), 1-31. Brown, C., Czerniewicz, L., & Noakes, T. (2015): Online content creation: Looking at students’ social media practices through a connected learning lens. Learning, Media and Technology, 41(1), 140-159. Case, A.F., & Traynor, J. (2016). Early field experience innovations to increase positive impact on K-12 students. AILACTE Journal, 13(1), 1-21. Creswell, J.W. (2007). Qualitative inquiry AND research design: Choosing among five approaches (2nd ed.). Thousand Oaks: SAGE. DelliCarpini, M., & Gulla, A. (2009). Success with ELLs. English Journal, 98(4), 133-137. Dewey, J. (1922). Democracy and education. New York, NY: Macmillan Company, 181. Dudeney, G., Hockly, N., & Pegrum, M. (2013). Digital literacies. London, UK: Pearson. Fabry, Dee. L., & John R. Higgs. (1997). Barriers to the effective use of technology in education: Current status. Journal of Educational Computing Research, 17, 385-395. Forgasz, R., Heck, D., Williams, J., Ambrosetti, A., & Willis, L.D. (2017). Theorising the thirdspace of professional experience partnerships. In J. Kriewaldt, A. Ambrosetti, D. Rorrison, & R. Capeness (Eds. ), Educating future teachers: Innovative perspectives in professional experience. Singapore: Springer. Gay, G. (2003). Becoming multicultural educators. San Francisco, CA: Jossey-Bass. Gee, J.P. (2003). What videogames have to teach us about learning and literacy. New York, NY: St. Martins. Glaser, B.G., & Strauss, A.L. (2017). Discovery of grounded theory: Strategies for qualitative research. New York, NY: Routledge. Gutiérrez, K. (2008). Developing a sociocritical literacy in the thirdspace. Reading Research Quarterly, 43(2), 148-164. Kirby, D.L., & Crovitz, D. (2013). Inside out: Strategies for teaching writing (4th ed.). Portsmouth, NH: Heinemann. Kist, W., & Pytash, K.E. (2015). “I love to flip the pages”: Preservice teachers and new literacies within a field experience. English Journal, 104(3), 131-167. Laughter, J. (2015). ELA teacher preparation 2.0: Critical media literacy, action research, and mashups. Contemporary Issues In Technology and Teacher Education, 15(3), 265282. Manca, S., & Ranieri, M. (2017). Implications of social network sites for teaching and learning. Where we are and where we want to go. Education and Information Technologies, 22(2), 605-622. Maul, A., Penuel, W.R., Dadey, N., Gallagher, L.P., Podkul, T., & Price, E. (2017). Measuring the experiences of interest-related pursuits in connected learning. Education Tech Research Dev 65, 1-28. McMahan, S.K., & Garza, R. (2017). Fostering preservice teachers' development: Engagement in practice and learning. Current Issues in Education, 19(3). Merriam, S.B. (1998). Qualitative research and case study applications in education: Revised and expanded from ‘Case study research in education.’ San Francisco, CA: JosseyBass. Munoz, L.R., Pellegrini-Lafont, C., & Cramer, E. (2014). Using social media in teacher preparation programs: Twitter as a means to create social presence. Penn GSE Perspectives on Urban Education, 11(2), 57-69. Noddings, N. (2013). Caring: A relational approach to ethics and moral education (2nd ed.). Berkeley, CA: University of California Press. Oliver, K., & Stallings, D. (2014). Preparing teachers for emerging blended learning environments. Journal of Technology and Teacher Education, 22(1), 57-81. Potter, J., & McDougall, J. (2017). Digital media, culture and education: Theorising ThirdSpace literacies. London, UK: Springer. Doi10.1057/978-1-137-55315-7_2Prensky,M. (2001a).Digitalnatives, digital immigrants part 1. On the Horizon, 9(5), 1-6. Stake, R.E. (1995). The art of case study research. Thousand Oaks, CA: SAGE Publications. Swenson, J., Young, C.A., McGrail, E., Rozema, R., & Whitin, P. (2006). Extending the conversation: New technologies, new literacies, and English education. English Education, 38(4), 351-369. Vartiaien, H., Pöllänen, S., Liljeström, A., Vanninen, P., & Enkenberg, J. (2016). Designing connected learning: Emerging learning systems in a craft teacher education course. Design and Technology Education, 21(2), 32-40. Vygotsky, L. (1978). Mind in society: The development of higher psychological processes. Cambridge, MA: Harvard UP. White, J.W., & Hungerford-Kresser, H. (2014). Character journaling through social networks: Exemplifying tenets of the new literacy studies. Journal of Adolescent& Adult Literacy, 57(8), 642-654.